$400 Mega Stack is now in the money! With the elimination of our 41st place finisher, all 40 remaining players in today's $400 Mega Stack Challenge are now in the money. All players are guaranteed at least $902, but all players have their eyes on the first place prize of $31,594. Make sure you watch the live stream at www.FoxwoodsLive.com the follow all of the action throughout the end of the tournament. With 42 players remaining in today's $400 Mega Stack Challenge, the tournament staff has paused the clock. Each table will play hand for hand until there are only 40 remaining players. At that point, the field will be in the money, and everyone will be guaranteed at least $902. First place is worth $31,594. The clock has started up again, and the official post-dinner player count is 104. Top 40 players get into the money, with a mincash worth $902. The remaining 110 players are now on their 1 hour dinner break. When they return, they will be playing 1,200/2,400 blinds with a 300 ante. The 140 remaining players now on a 10 minute break. They will come back, play the 1,000/2,000 blind level, and then take a 1 hour dinner break. The top 40 players today will make the money. Level 11 has begun, which means the blinds are now 600/1,200 with a 200 ante. Only 190 players remain at this point. After level 13, there will be a one hour dinner break. 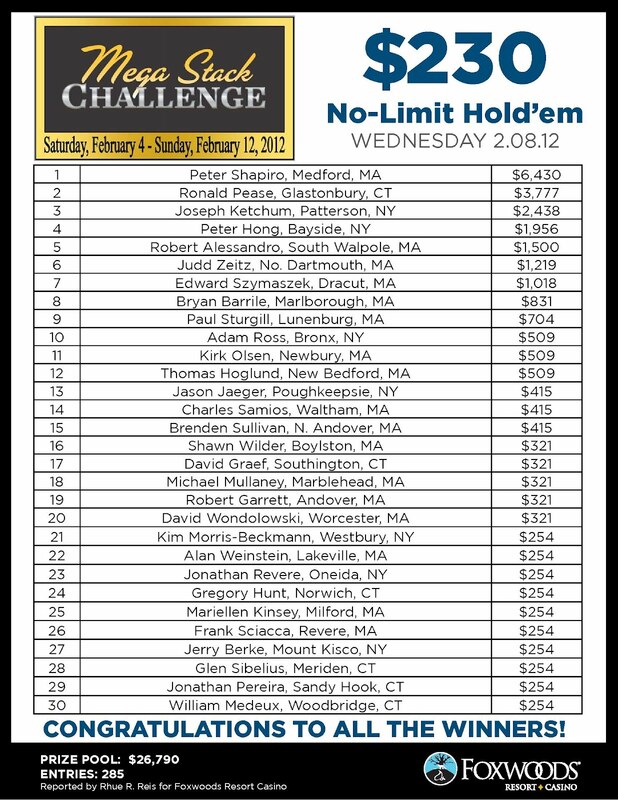 The $400 Mega Stack Challenge had 391 total entrants, and there are currently 315 players remaining. The blinds have just been increased to 300/600 with a 75 ante. 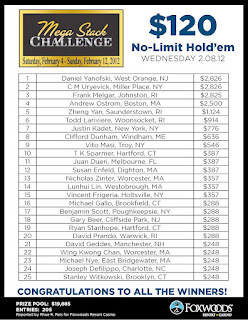 First place is $31,594, and full payouts will be posted shortly. 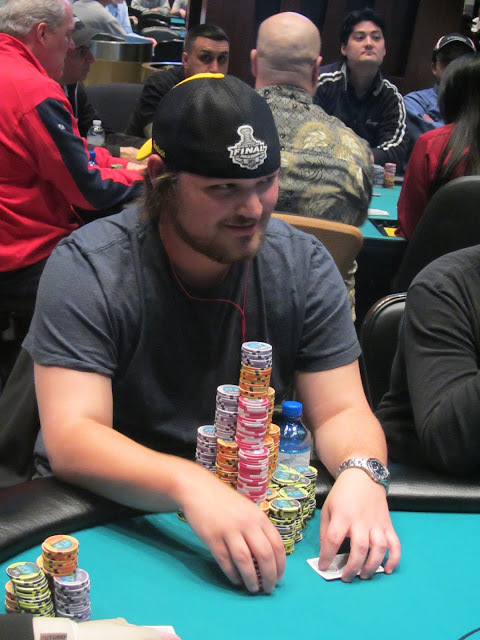 The players in the $400 Mega Stack Challenge are now on their first break of the day. When they return, they will be playing 100/200 blinds with a 25 ante. The board reads 384 entrants, but registration is still open for a few more minutes, so we'll have a final number and prize pool posted shortly. $400 Mega Stack about to begin! 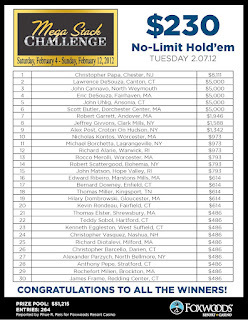 There's only a few minutes left until today's $400 Mega Stack Challenge begins. There's already over 230 players registered, and registration will stay open for a few levels.